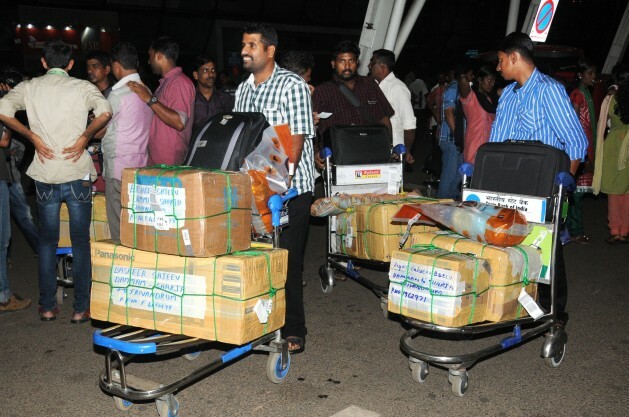 Workers returning to Kerala from the Gulf. Credit: K.S. Harikrishnan/IPS. THIRUVANANTHAPURAM, India , Jan 8 2014 (IPS) - Ashik Rehman, 47, worked as a labourer in the southern Indian state of Kerala. He left for Saudi Arabia two years ago, hoping to earn enough to buy a house in his native place. Now he is back and staring at a bleak future. Rehman was promised a shop salesman’s job by his travel agent. But after he landed in the Saudi capital Riyadh, he was sent to work at a construction site as a sweeper. His sponsor did not take legal measures to correct his work permit. “I was treated like a slave there. I was not given proper food, leave or salary,” he told IPS. “Many sponsors are evasive when it comes to giving legal status to workers." To make things worse, Saudi Arabia enforced a naturalisation rule called Nitaqat, forcing Rehman to return to his hometown Kozhikode in Kerala last October. He has not found a job yet. The Nitaqat law, announced in 2011, makes it mandatory for all private firms to recruit at least 10 percent Saudi nationals in their labour force. For expatriates who do not have proper job or visa documents, the law entails punitive measures such as arrest or deportation. With 2.8 million Indians making up the largest expatriate community in Saudi Arabia, the law has hit those who have been in the kingdom without proper work documents. “Many sponsors are evasive when it comes to giving legal status to workers. Because of the disinterest of my sponsor, I had to return. Now I am living in a rented house and trying to figure out how to earn my living,” Rehman told IPS. According to Indian government estimates, 134,000 workers have returned due to implementation of the new Nitaqat policy. The reverse migration of undocumented workers from Saudi Arabia has prompted the returnees to demand that the Indian government implement a comprehensive rehabilitation package for expatriates. “Since the Gulf War of 1990-1991, we have been hearing false promises of rehabilitation packages,” said S. Ahmed, chairman of the NRI Coordination Council. He said the government had done little to help expatriates who had to return because of the Nitaqat rule. The Council demanded that all non-resident families that return from Saudi Arabia be included in a comprehensive health insurance project. The effects of Nitaqat are showing up in many ways in India particularly in sectors dependent on Gulf money. These include a slowdown in construction work, in the real estate business, in motor vehicle sales and dwindling wages of daily workers. This is particularly true of Kerala because, of the 2.8 million Indians in Saudi Arabia, one million are from this state. After the United Arab Emirates, Saudi Arabia is the most favoured destination for the state’s migrant population. Dr. Sree Nair, a Kerala-based migration researcher, said the government should make sure that the returnees are rehabilitated and resettled in their homeland. “Return migrants do not attract much attention from the government. But Nitaqat has brought about a situation where the void in government planning on migration and a remittance-dependent economy has become evident,” she told IPS. “The services for returnees are inadequate. Not just financial assistance but proper guidance on possible areas of utilising their skills in domestic or foreign labour markets should also be provided. Most returnees are not looking for freebies from the government but for an appropriate re-entry into job markets,” she told IPS. Kerala is the only state in the country which has announced rehabilitation measures for returnees, including interest-free loans and services to help them find jobs in other Gulf countries. Abu Ali, who gives legal aid to foreign workers in Jeddah, said there were many foreigners, including Indians, who were declared to be absconding by their sponsors as the latter wanted to avoid making final settlements. “Many migrants may have been working there for more than 10 years, but there is no legal forum to challenge sponsors who cheat,” he told IPS. K.U. Iqbal, a Riyadh–based reporter of Malayalam News, a sister publication of Arab News, told IPS over the phone that 1.3 million Indian workers, who initially did not have proper documents, had regularised their work permits and completed other legalities. “The majority of Indians corrected their documents. It is said that a few migrants did not apply for legal status. They will face consequences if caught by the authorities,” he said. A group of returnees told IPS that unskilled workers, part-time office workers and school teachers have been particularly badly hit by the Nitaqat rule. Labour inspectors swooped down on thousands of illegal workers in a series of raids across the Kingdom after the amnesty period for expatriates to legalise their work status expired. Shameem Ahmed, general manager of the Thiruvananthapuram-based Overseas Development and Employment Promotion Consultants, quoted Indian government officials in Riyadh to say that many workers were unwilling to go back to India as they were wary of being unemployed and increasing the financial burden on their families. “Many workers have not been reporting for work for fear of arrest and deportation. Numerous construction companies that were largely dependent on the illegal workforce have suspended their projects altogether. Housing unit prices are set to increase dramatically due to the shortage of workers,” said Shameem Ahmed. According to the World Bank, India is the top beneficiary of remittances from Saudi Arabia with 8.4 billion dollars received in 2012. But many of the people behind those remittances now find that life has changed – for the worse. It also seems Saudis are protecting their people from unemployment too…and forcing the companies to give legal status to the immigrants….that is not bad.